Zane Grey Ballroom at the Hotel Weatherford 23 N. Leroux St.
Tickets are $20 in advance. $2 discount to seniors, students and members of NACHS and FFOTM. Tickets are available at Cedar Music. ALL tickets are $22 at the door! Beoga (Irish word for ‘lively’) are a five-piece traditional band based in County Antrim, Ireland. The band was drawn together after ‘jamming’ in a ferocious music session at the All-Ireland Fleadh in August 2002. Their unique sound features the twin duelling accordians of Seán Óg Graham and Damian McKee, along with four times All-Ireland bodhrán champion Eamon Murray and pianist Liam Bradley. 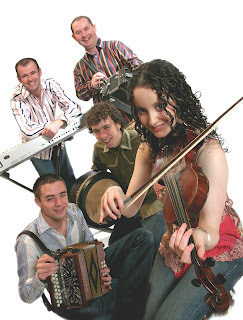 In 2005, Beoga were nominated by Irish Music Magazine for the best traditional newcomer’s award. With the addition of one of Ireland’s premier young singers, Niamh Dunne, Beoga are confirming their reputation as one of the most exciting acts to emerge from Ireland in recent years. Beoga will be making their Arizona premier Friday, February 27, 2009 at 8:00pm. They will perform at The Orpheum Theater in downtown Flagstaff at 15 W. Aspen Ave. The doors will open at 7:00pm. Tickets are $20 general admission and $12 for students and children. Tickets are available at Rainbow’s End and Animas Trading Company in downtown Flagstaff or online at www.orpheumpresents.com. Beoga is presented by Living Traditions Presentations. The concert is sponsored in part by Culture Ireland and the Northern Arizona Celtic Heritage Society. For more information, please contact Kari Barton at Kari@LivingTraditionsPresentations.com.